I have a frequent problem with the tiling generators and splatters, when it comes to colorization. For instance here, with this leaf splattering, I want to macro-color the 2nd splatter by ring, while still having a micro-color gradient along each leaf slope. But doing so, I have to duplicate the Splatter circular node to get a gradient according to ring number, that will allow me to mask the HSL. Problem is : each time I want to change the splattering settings, I have to copy parameters over to the duplicate. 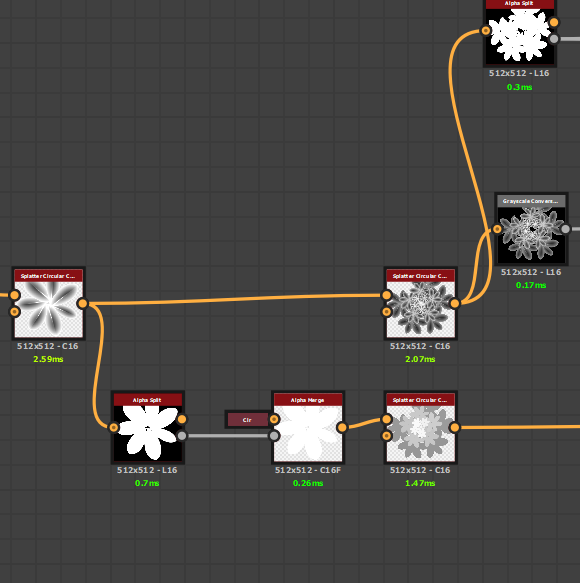 Is their a way to automatically connect these 2 nodes parameters / to output this ring number from the splatter without needing a duplicate ? Or whatever that could allow me to avoid this parameter copy each time ? I'm not sure I entirely understand what you're trying to accomplish, but would it work to create a sub-graph that includes the specific splatter process? You can expose the parameters that change while leaving the others "hard coded" in that sub-graph. 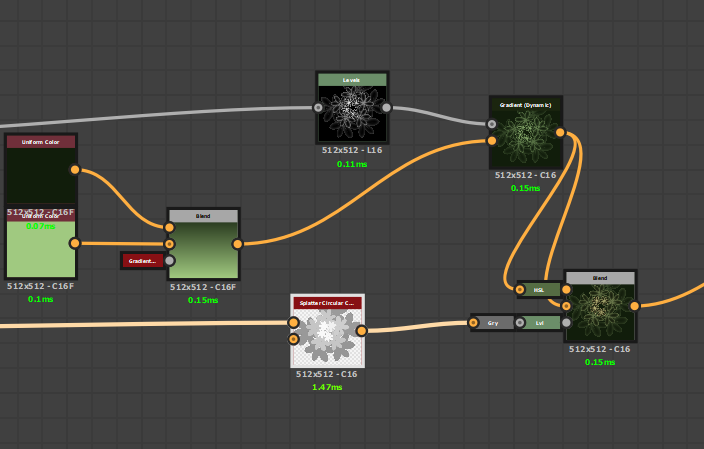 Then you can use that node as many times as you want in your primary graph while you input the varying data. Another idea is to create your own "exposed" variables and link them up to both splatter nodes where needed. If you don't want these variables to be visible, maybe put a "0" in the "visible if" section (I have not tested that).